ww2dbaseHenry Harley "Hap" Arnold was born in Gladwyne, Pennsylvania, United States to a physician who also served in the National Guard (a reserve military force of the United States). He graduated from Lower Merion High School in Ardmore, Pennsylvania in 1903 and graduated from the United States Military Academy at West Point, New York as an infantry officer in 1907; he wanted to be a cavalry officer, but his list of demerits, a result of the pranks he had pulled during his years at the academy, prevented his wish from coming true. His first posting was to the 29th Infantry Regiment in the Philippine Islands. His disliking for the infantry led him to join the Signal Corps, which was currently conducting an aerial survey of the Filipino island of Luzon through its Aeronautical Division. On 21 Apr 1911, after being transferred back to the United States two years earlier, Special Order 95 sent him along with another man, Thomas Milling, to Ohio, United States for flight instructions from civilian aviators. After receiving his flight certificate, Arnold and Milling became US Army's first flight instructors based out of College Park, Maryland, United States. In Oct 1912, the two pilots were sent to Fort Riley, Kansas, United States to experiment aerial spotting for field artillery. ww2dbaseArnold broke record after record as one of the earliest US military aviators, but he also suffered several crashes and had second thoughts of his career as a pilot. After a 5 Nov 1912 crash, he applied and was granted a leave of absence. He took a staff assignment in Washington DC, United States on 1 Dec and then re-joined the infantry. ww2dbaseOn 10 Sep 1913, Arnold married Eleanor Pool, daughter of a family friend. Milling acted as his best man. ww2dbaseIn Jan 1914, Arnold was reassigned to the Philippine Islands, quartered next to George Marshall who would become his life-long friend. In Jan 1916, he returned to the United States and joined the 3rd Infantry Regiment. At this time, he received a telegram from Major William Mitchell who offered him the rank of captain if he would return to aviation; Arnold took the offer and joined the Aviation Section of the US Army Signal Corps. On 26 Nov 1916, he flew solo for the first time since he took the leave of absence over four years earlier. On 29 Jan 1917, he was assigned to Panama Canal Zone to find a suitable location for a new airfield, and command of the squadron that would be based there was to be given to him. Before the airfield location was determined, however, the United States entered WW1. He was given a war time rank of major, which pleased him, but to his dismay he was given staff positions in Washington DC. On 5 Aug 1917, he was given the rank of colonel in the Signal Corps in preparation for being named executive officer of the Aviation Section ten days later. In this new role, he failed to convince the US Congress to approve a large aviation appropriations bill, although through this failure he would gain valuable experience in aircraft production and politics. ww2dbaseDuring the inter-war years, Arnold was instrumental in the formation of the US Army Air Corps, made official on 14 May 1918, which was on equal footing as the Signal Corps. Between Aug and Dec 1924, he attended Army Industrial College. In Jan 1925, he was assigned the chief of Air Service Information Office under Mitchell. After the court martial of Mitchell, Arnold survived the fiasco but was transferred to Fort Riley, Kansas, United States, an assignment that was in effect a demotion, or at least a detriment to career advancement, for an officer in US Army aviation. With the help of Major General James Fechet, he attended the General Staff School in 1929 and was appointed the commander of Fairfield Air Service Depot, Ohio, United States, thus getting back on track to an aviator's career path. On 1 Feb 1931, he was promoted to the rank of lieutenant colonel while holding the position of the executive officer of the Air Materiel Division. In the early 1930s, he further helped the image of the Army Air Corps by flying food-drops during the blizzards of 1932 to 1933, assisting in the aftermath of the earthquake of Mar 1933, establishing a Conservation Corps camp, and having his officers join local social service organizations. On 9 Mar 1935, he became the wing commander of the First Wing at March Field in California, United States following being given a temporary rank of brigadier general one week earlier. In Sep 1938, after the loss of the Air Corps' chief Major General Oscar Westover in an air crash, Arnold was named the new chief with the promotion to the permanent rank of major general. In this role, he would contribute to the establishment of a partnership with the California Institute of Technology which advanced military aircraft designs. ww2dbaseArnold was an uncompromising leader. He was very demanding on his staff officers, rarely tolerating any delay or failure. Nevertheless, he was much respected by his subordinates. ww2dbaseOn 20 Jun 1941, the United States Army Air Force was formed with Arnold as its chief. In this role he was credited in the formation of plan AWPD-1, which became the basis of the air strategy during WW2. He also planned the formation of the Eighth Air Force in Britain, which would play a key role in the strategic bombing of Germany later in the war. After the US entrance into WW2, Arnold was given the rank of lieutenant general and was given autonomy to operate his air units without US Army influence. As the commanding officer of what essentially was a separate branch, he was also made a member of the Joint Chiefs of Staff and the Combine Chiefs of Staff. On 19 Mar 1943, he was promoted to the rank of general. On 21 Dec 1944, he was promoted to the rank of General of the Army, a five-star rank. He oversaw strategic air operations in all theaters with US involvement, including the B-29 bombing campaign that brought Japan devastation near the end of the war. ww2dbaseBetween 1943 and 1945, Arnold suffered from four heart attacks severe enough to require hospitalization, but he refused to slow down. Even though he suffered a heart attack in Jan 1945, for example, he refused to end his on-going tour of various bases in Italy. This was only one of many examples of his passion for his profession, but many also argue that it was also indicative of his greatest weakness: his inability to delegate responsibility to his subordinate. 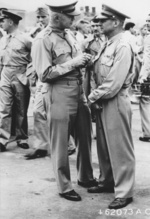 ww2dbaseIn Jan 1946, while in South America, Arnold developed a heart arrhythmia. He retired from service in 1946 to his ranch near Sonoma, California, United States. He suffered his fifth heart attack in Jan 1948 while writing his memoirs, and he would be hospitalized for three months. He passed away in 1950 and was buried at Arlington National Cemetery in Arlington, Virginia, United States. He left the legacy of being the first and only General of the Air Force and the only American hold the five-star ranks in two separate branches of the US military. 25 Jun 1886 Henry Arnold was born in Gladwyne, Pennsylvania, United States. 14 Jun 1907 Henry Arnold was promoted to the rank of second lieutenant. 7 Dec 1907 Henry Arnold arrived in Manila, Philippine Islands. 21 Apr 1911 Henry Arnold and Thomas Milling received instructions to go to Ohio, United States for flight training with the intention of making them the first US Army flight instructors. 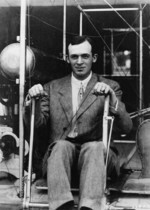 3 May 1911 Henry Arnold began receiving flight instruction. 13 May 1911 Henry Arnold made his first solo flight. 14 Jun 1911 Henry Arnold was assigned to the Aeronautical Division of the US Army Signal Corps based in College Park, Maryland, United States. 6 Jul 1911 Henry Arnold recieved Fédération Aéronautique Internationale (FAI) pilot certificate No. 29. 7 Jul 1911 Henry Arnold set an altitude record of 990 meters, or 3,260 feet. 18 Aug 1911 Henry Arnold set an altitude record of 1,270 meters, or 4,167 feet. 25 Jan 1912 Henry Arnold set an altitude record of 1,452 meters, or 4,764 feet. 1 Jun 1912 Henry Arnold set an altitude record of 1,990 meters, or 6,540 feet. 26 Jun 1912 Henry Arnold crashed the US Army's first front-mounted propeller-and-engine aircraft on takeoff into the bay at Plymouth, Massachusetts, United States. 2 Nov 1912 Henry Arnold successfully established radio telegraph connection from his Wright C Speed Scout S. C. No. 10 aircraft with units on the ground about 9.7 kilometers, or 6 miles, away while in flight over Fort Riley, Kansas, United States. 5 Nov 1912 Henry Arnold suffered injuries in an air crash, and would be given a leave of absence from the Aviation Section of the US Army Signal Corps. 1 Dec 1912 Henry Arnold was transferred to the Aeronautical Division of the Office of the Chief Signal Officer of the US Army in Washington DC, United States. 10 Apr 1913 Henry Arnold was promoted to the rank of first lieutenant. 10 Jul 1913 Henry Arnold was assigned to 9th Infantry Regiment. 1 Sep 1913 Henry Arnold was assigned to 13th Infantry Regiment. 10 Sep 1913 Henry Arnold married Eleanor Pool. 17 Jan 1915 Henry Arnold's daughter Lois Elizabeth Arnold was born at Fort William McKinley in Manila, Philippine Islands. 20 May 1916 Henry Arnold was made a supply officer at the US Army Signal Corps Aviation School at Rockwell Field in San Diego, California, United States. 23 Sep 1916 Henry Arnold was promoted to the rank of captain. 26 Nov 1916 Henry Arnold took his first solo flight since his leave of absence from the Aviation Section of the US Army Signal Corps in 1912. 29 Jan 1917 Henry Arnold's son Henry Arnold, Jr. was born. 30 Jan 1917 Henry Arnold was ordered to travel to the Panama Canal Zone in search for locations to build a new airfield. 5 Feb 1917 Henry Arnold assumed command of 7th Aero Squadron in New York, New York, United States; the squadron was destined for the Panama Canal Zone. 1 May 1917 Henry Arnold began a period of various staff positions in Washington DC, United States. 27 Jun 1917 Henry Arnold was promoted to the temporary rank of major. 5 Aug 1917 Henry Arnold was promoted to the temporary rank of colonel. 1 Oct 1917 Henry Arnold was made the executive officer of the Air Division of the US Army Signal Corps. 17 Jul 1918 Henry Arnold's son William Bruce Arnold was born. 11 Nov 1918 Henry Arnold arrived on the front lines in France as the war was coming to an end. 10 Jan 1919 Henry Arnold was made the District Supervisor of Western District of the Air Service of the US Army. From his office at Rockwell Field, San Diego, California, United States, he was responsible for the demobilization of 8,000 airmen and surplus aircraft. 30 Jun 1920 Henry Arnold reverted to his permanent rank of captain. 11 Aug 1920 Henry Arnold was promoted to the permanent rank of major and was transferred to the US Army Air Service by the US War Department Special Order No. 188-0. 30 Jun 1923 Henry Arnold's son John Arnold passed away from acute appendicitis. 22 Mar 1926 Henry Arnold was officially reprimanded for violating Army General Order No. 20 and was transferred to Fort Riley, Kansas, United States as the commanding officer of 16th Observation Squadron. 24 Feb 1927 Henry Arnold's son David Lee Arnold was born at Fort Riley, Kansas, United States. 1 Feb 1931 Henry Arnold was promoted to the rank of lieutenant colonel. 27 Nov 1931 Henry Arnold was made the commanding officer of March Field, California, United States. 4 Jan 1933 Henry Arnold was made the commanding officer of 1st Wing of US Army Air Corps. 2 Mar 1935 Henry Arnold was promoted to the temporary rank of brigadier general. 9 Mar 1935 Henry Arnold was named the wing commander of the First Wing of the US Army Air Corps, based at March Field, Moreno Valley, California, United States. 23 Dec 1935 Chief of Staff General Malin Craig summoned Henry Arnold to Washington DC, United States. 24 Dec 1935 Henry Arnold was made the Assistant Chief of the US Army Air Corps. 1 Mar 1936 Henry Arnold was promoted to the permanent rank of colonel. 22 Sep 1938 Henry Arnold was made the Chief of the US Army Air Corps. 1 Sep 1939 Henry Arnold submitted a report on the organization of US Army air units and recommendations on doctrine to US Army Chief of Staff George Marshall. 12 Mar 1940 Henry Arnold received a warning from Franklin Roosevelt for having voiced complaints against policies set forth by Roosevelt's cabinet. 5 Oct 1940 Henry Arnold submitted a proposal for the reorganization of US Army air units to US Army Chief of Staff George Marshall; the proposal called for a separate staff for air apart from the ground and supply units. 2 Dec 1940 Henry Arnold was promoted to the permanent rank of brigadier general. 3 Feb 1941 Henry Arnold was promoted to the permanent rank of major general. 20 Jun 1941 The United States Army Air Corps (USAAC) was renamed the United States Army Air Force (USAAF) under the command of Major General Henry H. "Hap" Arnold. The USAAF was to be autonomous from the US Army. 15 Dec 1941 Henry Arnold was promoted to the rank of lieutenant general. 2 Jan 1942 What was later to be known as the USAAF Eighth Air Force was established as the Fifth Air Force at Savannah Army Air Base, Georgia, United States under the command of Major General Henry "Hap" Arnold. The original plan was to provide air support for an envisioned Allied invasion of North Africa. 28 Feb 1943 Henry Arnold suffered his first heart attack and was hospitalized at Walter Reed Army Hospital in Washington DC, United States for several days. 8 Mar 1943 Henry Arnold arrived in Kansas, United States. 11 Mar 1943 The Pacific Military Conference began at the Munitions Building in Washington DC, United States. Henry Arnold, George Marshall, Ernest King, William Leahy, Geroge Kenney, and Richard Sutherland were among the attendees of the opening meeting. 19 Mar 1943 Henry Arnold was promoted to the rank of general. 10 May 1943 Henry Arnold suffered his second heart attck and was hospitalized at Walter Reed Army Hospital in Washington DC, United States for several days. 20 May 1943 Henry Arnold was released by Walter Reed Army Hospital in Washington DC, United States. 10 May 1944 Henry Arnold suffered his third heart attack. 7 Jun 1944 Henry Arnold arrived in London, England, United Kingdom. 21 Dec 1944 Henry Arnold was promoted to the temporary rank of General of the Army. 17 Jan 1945 Henry Arnold suffered his fourth heart attack. 7 May 1945 Henry Arnold was relieved of command at the US Twentieth Air Force. 28 Feb 1946 Henry Arnold was removed from the active list of the US Army Air Force due to a heart arrhythmia. 23 Mar 1946 Henry Arnold was promoted to the permanent rank of General of the Army. 30 Jun 1946 Henry Arnold retired from active military service. 7 May 1949 US Public Law 58-81 changed Henry Arnold's rank of General of the Army to General of the Air Force, making him the only man to hold five-star rank in two separate US military branches. 15 Jan 1950 Henry Arnold passed away in Sonoma, California, United States. With the end of World War II the Army Air Forces demobitized on V-J Day August 15, 1945. The U.S.A.A.F. had 2,253,000 personnel and 70,000 Aircraft. Within two years, those numbers had been reduced to 300,000 personnel and 4,750 Aircraft. Military Aircraft Production reached a peak of 100,000 per year in 1944, and fell to 700 Aircraft in 1947. In December 1938 Army Air Corps personnel both officers and enlisted men numbered 21,125, by December 1943 the Army Air Forces as it was now named reached 2,373,882, with an annual appropriation of $23,655,998,00 in funds for Army aviation in 1944. What does it take to build one four engine bomber? One 4-engine bomber requires enough aluminum for 55,000 coffee percolators, enough alloy steel to make 6,800 electric irons, enough steel for 160 washing machines, enough rubber to recap 800 automobile tires, enough copper for 550 radio receivers. Put aircraft production another way. A total of 19,000 B-24's of all models were built. If you parked all the bombers nose to tail they would extend for 245 miles! What did all those airplanes cost? just some examples: 9,535 P-38's $97,147 each 15,579 P-47's $85,578 each 14,490 P-51's $51,572 each 12,677 B-17's $204,370 each 18,188 B-24's $215,516 each Who were the men who flew and maintained the aircraft: The USAAF trained 193,440 pilots, trained over 400,000 aircrew they were the navigators, gunners, flight engineers and other specialists. To support one man in combat, the AAF had to field sixteen noncombat personnel. There were seven ground crew for every man who flew and four ground technical specialists for every one man in the air. How much were they paid? In 1944 Enlisted pay Private $50.00 a month Staff Sergeant $96.00 a month Master Sergeant $138.00 a month Officers per year: Second Lieutenant $1,800 Major $3,000 Colonel $4,000 Four Star General $8,000 In 1944 this is what it cost to equip one fighter pilot: Gloves $1.74 Goggles $10.74 Sun glasses $3.25 Helmit $1.16 A-2 jacket $8.12 Winter flying jacket $25.00 Summer flying suit $8.50 Mae West life vest $10.00 Added equipment wrist watch,.45 Pistol w/Holster, parachute, flying boots and silk scarf. There never was, and never will be another flying aarmada to equal the wartime US Army Air Forces. What did those aircraft cost? 9,815 B-25's $142,194 5,157 B-26's $192,427 3,760 B-29's $605,360 7,230 A-20's $100,800 2,446 A-26's $192,457 Flight pay: In 1945 A Technical Sergeant made $114.00 a month, add flight pay, and it goes up to to $171.00 per month. Add overseas pay and its $193.00 per month. A Captain earned $200 per month, with flight pay it was $300.00, add overseas pay and it went to $350.00 per month. During World War II the U.S. Army Air Forces trained 497,533 Aircraft and Engine Mechanics, 347,236 Gunners, 195,422 Radio Mechanics and Operators, 50,976 Navigators, 47,354 Bombardiers and 193,440 Pilots. Hey Bill, do you know anything about Henry Arnold's colleagues?